Of all these reboots it seems to me that the My Little Pony brand has been the most popular. Walk through any store that offers children’s products and tell me you don’t see something, at minimum just one item, that’s covered with the bright cartoon horses. There are grown men – and women for that matter – who actually devote their lifestyles to the Pony fandom. While we have no Bronies or Pegasisters in this house, my 5-year-old daughter has been fully indoctrinated into the MLP fold. All I had to say to her was that I downloaded a new MLP app called Cutie Mark Chronicles and she had her hands out waiting for the iPad in under 3 seconds flat. She has played on and off for the last two days without any instruction or help from me. I played the game myself to test it out (okay, maybe I’m a fledgling Pegasister but shhhh – it’s our secret) and I could easily play, and further, understand why it is my daughter enjoys it. Without sounding too much like a giant dork, I need to explain a little bit of back story about Ponies. All of them have something special that they’re really good at, and a small mark on their hindquarters (called a Cutie Mark) appears when they figure out their specialty. The app revolves around this journey for a handful of ponies, and includes not only interactive storybooks but als0 6 character-driven activities. At first glance this seemed to be just another Pony app to add to our rapidly expanding collection. But a day into playing my almost-kindergartener started using words like “spectacular’ and “assistance”, and she was using them correctly and in context. Then I overheard her playing the game and sure enough, those same words were used in the storyline. The fun activities also help to boost hand-eye coordination and problem solving skills, and they did: my daughter hasn’t once asked me to help her finishe a puzzle or a maze within the app. 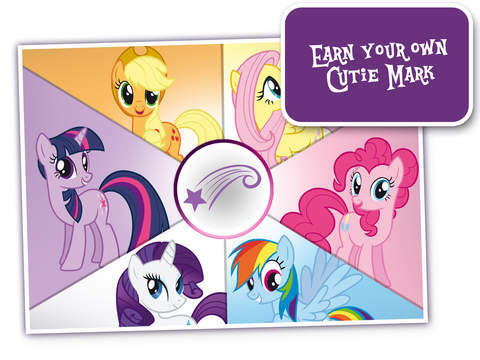 My Little Pony – The Cutie Mark Chronicles isn’t cheap, ringing up at $3.99. This app is great for early learners that have a penchant for all things Pony. (Or if you’re a Pegasister/Brony, just sayin’) Full disclosure: I received a promo code for this download but had I not, I doubt I would have considered buying this app without playing it first and understanding its secondary educational value. The advantage to a higher upfront cost, though, is the app doesn’t have pesky IAPs or hidden pay-for-play costs.